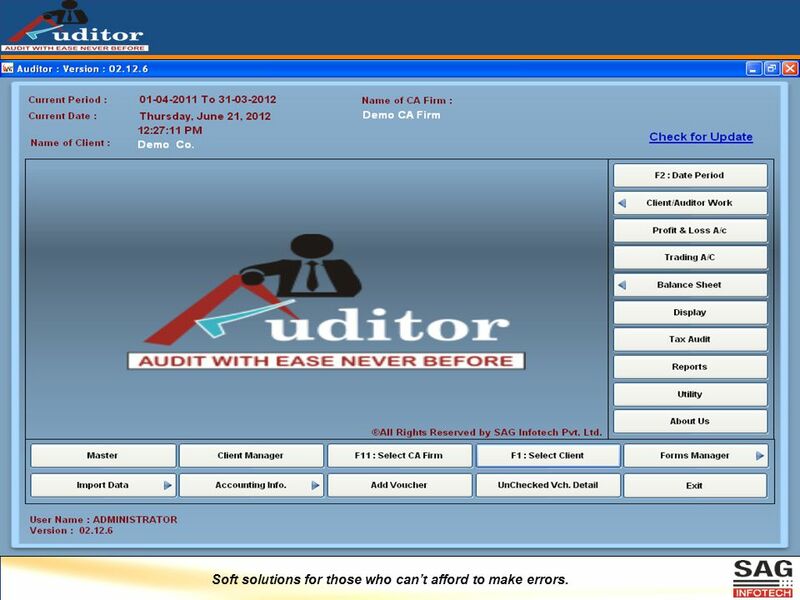 2 The purpose of Auditor Software:- This software is basically for Tax Audit purpose which is required u/s 44AB of The Income Tax Act, 1961. 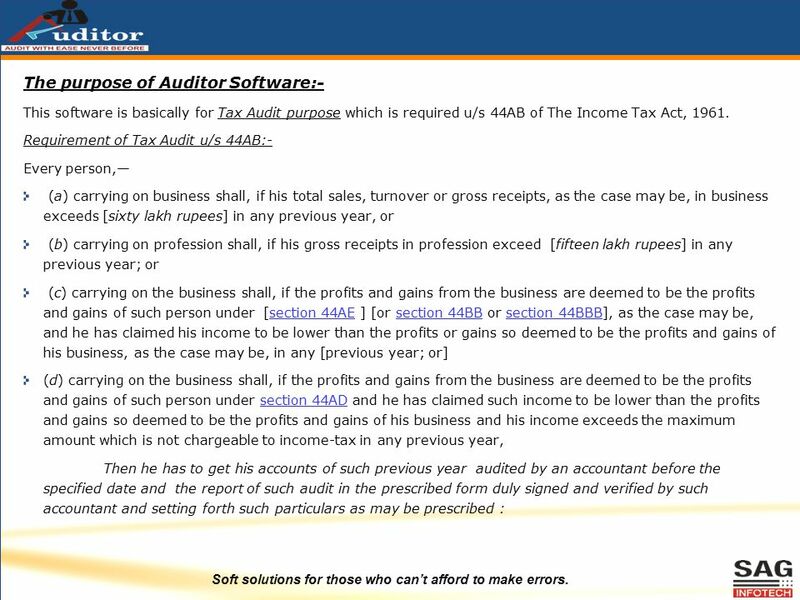 Requirement of Tax Audit u/s 44AB:- Every person,— (a) carrying on business shall, if his total sales, turnover or gross receipts, as the case may be, in business exceeds [sixty lakh rupees] in any previous year, or (b) carrying on profession shall, if his gross receipts in profession exceed [fifteen lakh rupees] in any previous year; or (c) carrying on the business shall, if the profits and gains from the business are deemed to be the profits and gains of such person under [section 44AE ] [or section 44BB or section 44BBB], as the case may be, and he has claimed his income to be lower than the profits or gains so deemed to be the profits and gains of his business, as the case may be, in any [previous year; or]section 44AEsection 44BBsection 44BBB (d) carrying on the business shall, if the profits and gains from the business are deemed to be the profits and gains of such person under section 44AD and he has claimed such income to be lower than the profits and gains so deemed to be the profits and gains of his business and his income exceeds the maximum amount which is not chargeable to income-tax in any previous year,section 44AD Then he has to get his accounts of such previous year audited by an accountant before the specified date and the report of such audit in the prescribed form duly signed and verified by such accountant and setting forth such particulars as may be prescribed : Soft solutions for those who can’t afford to make errors. 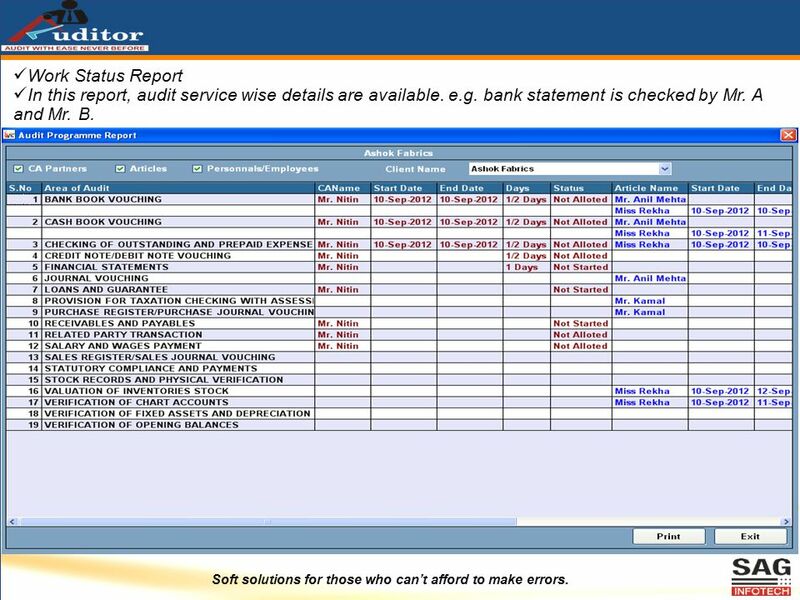 4 Key features of Auditor: Auditor is an integrated audit management software designed to meet the challenges of auditing against a diverse set of regulations and standards. 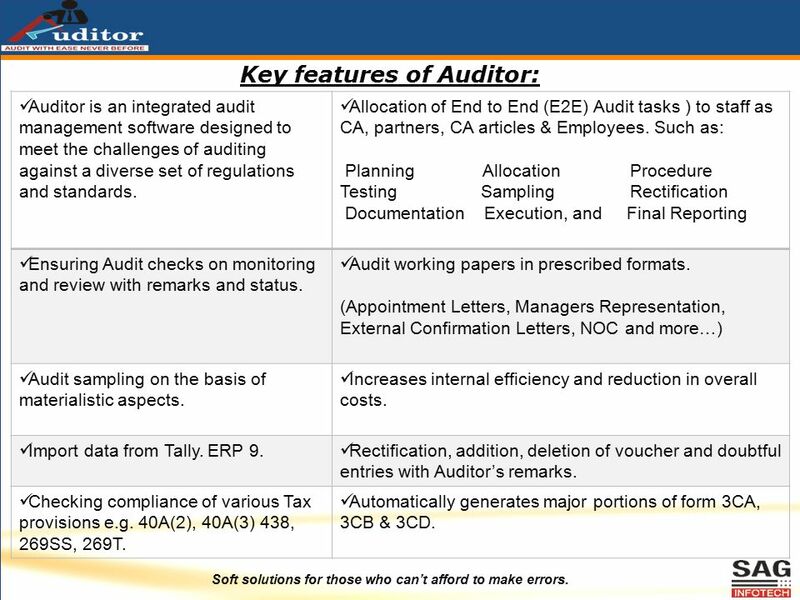 Allocation of End to End (E2E) Audit tasks ) to staff as CA, partners, CA articles & Employees. Such as: Planning Allocation Procedure Testing Sampling Rectification Documentation Execution, and Final Reporting Ensuring Audit checks on monitoring and review with remarks and status. 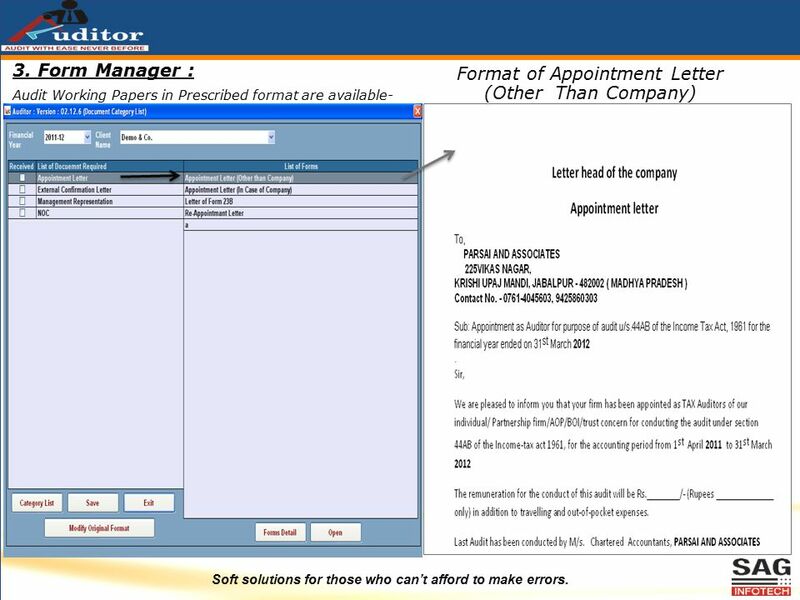 Audit working papers in prescribed formats. (Appointment Letters, Managers Representation, External Confirmation Letters, NOC and more…) Audit sampling on the basis of materialistic aspects. Increases internal efficiency and reduction in overall costs. Import data from Tally. ERP 9. 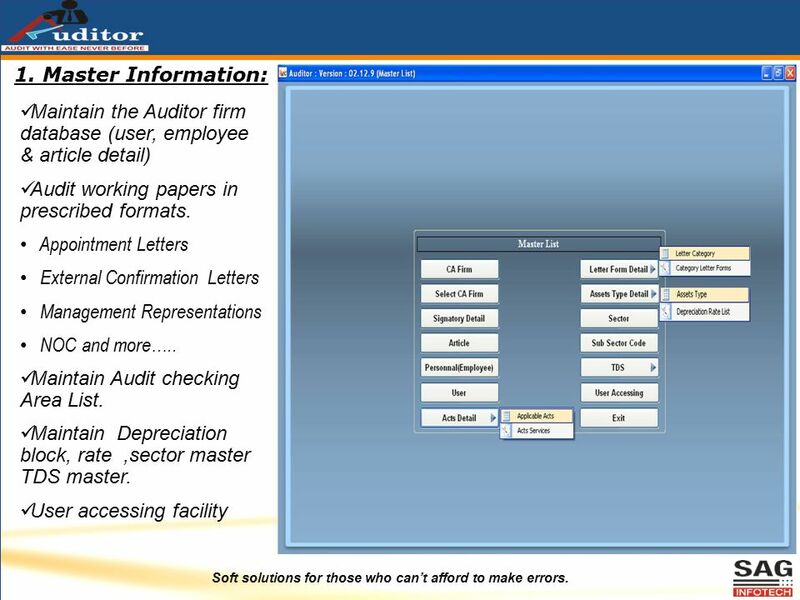 Rectification, addition, deletion of voucher and doubtful entries with Auditor’s remarks. Checking compliance of various Tax provisions e.g. 40A(2), 40A(3) 438, 269SS, 269T. 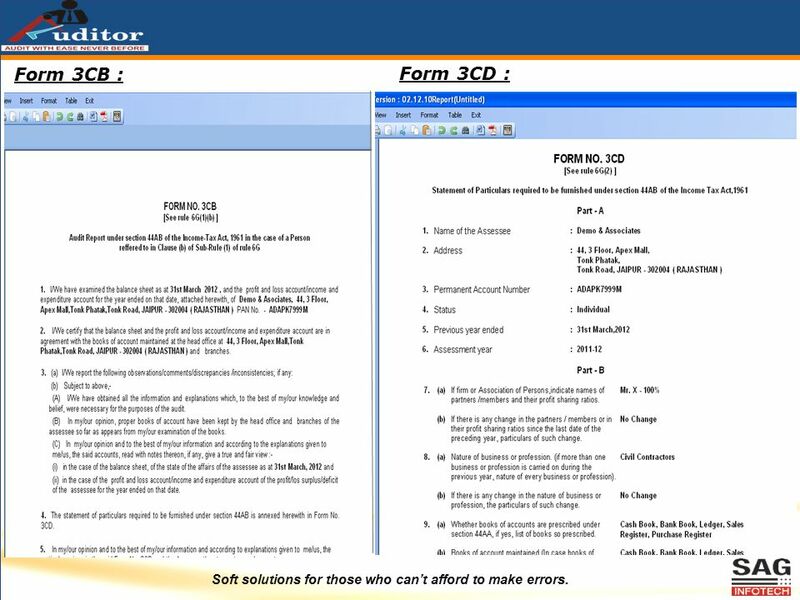 Automatically generates major portions of form 3CA, 3CB & 3CD. 6 Soft solutions for those who can’t afford to make errors. 2. Client Manager : Maintain the year wise clients details with password setting. Details of clients can be imported from previous year to current year. Backup and Restore facility is available for individual client Import client details from Genius Software is also possible. 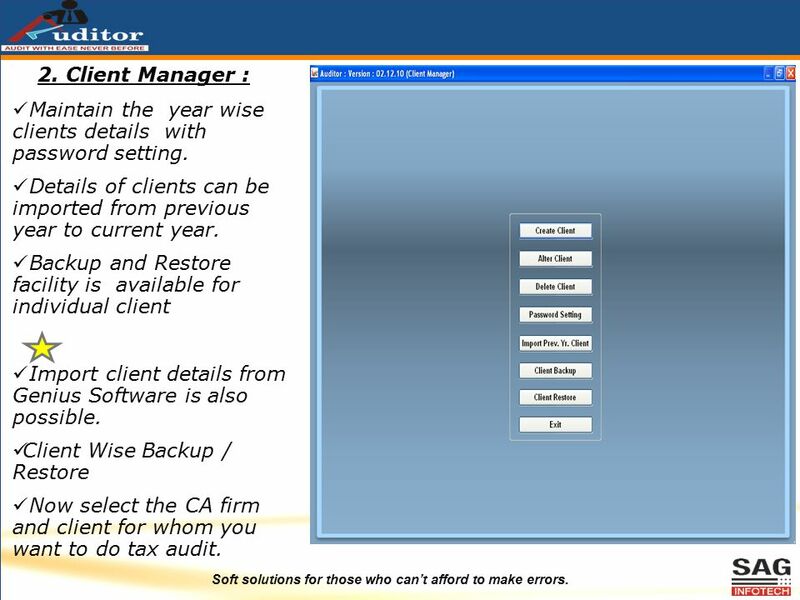 Client Wise Backup / Restore Now select the CA firm and client for whom you want to do tax audit. 9 Soft solutions for those who can’t afford to make errors. 5. How To Comply The Provisions of TDS : Map the Expense Ledger, Tax Ledger and TDS Party Ledger. In the Tax Audit- TDS Details, you can View the TDS details. 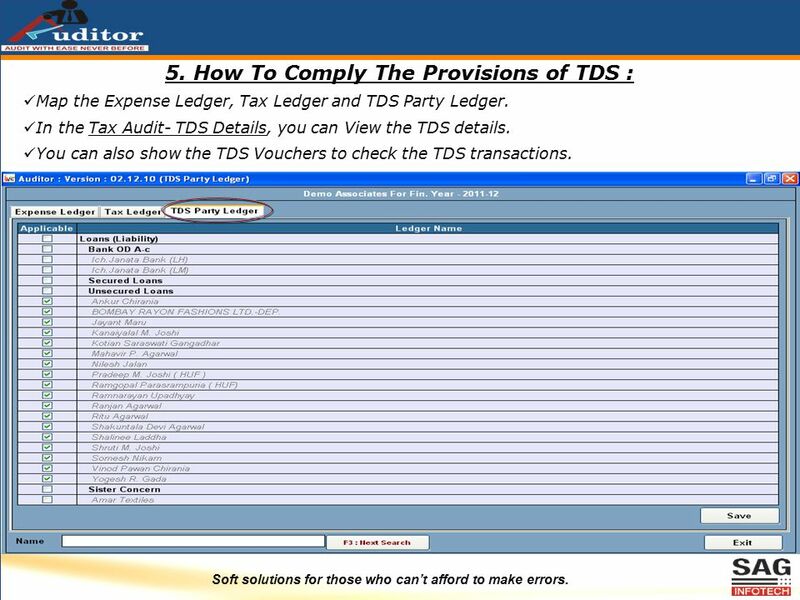 You can also show the TDS Vouchers to check the TDS transactions. 10 Soft solutions for those who can’t afford to make errors. 6. 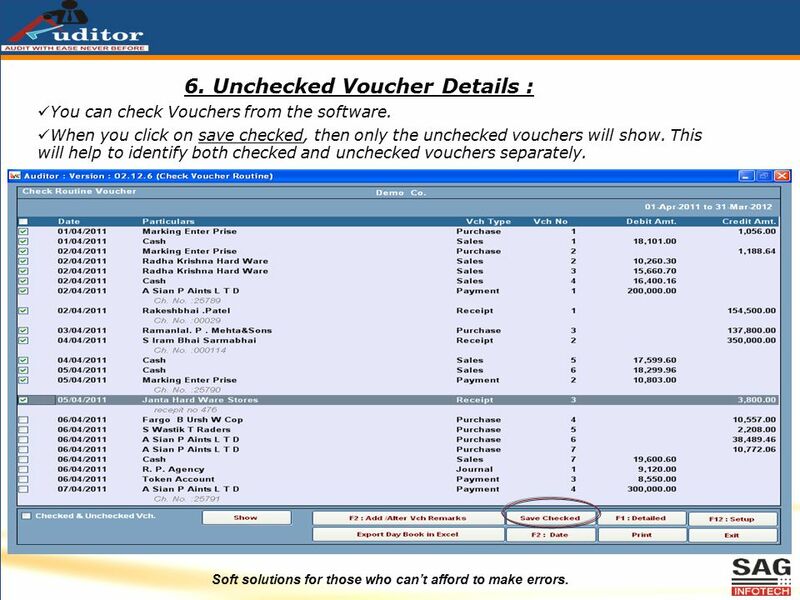 Unchecked Voucher Details : You can check Vouchers from the software. When you click on save checked, then only the unchecked vouchers will show. This will help to identify both checked and unchecked vouchers separately. 11 Soft solutions for those who can’t afford to make errors. 7. Audit Staff Management (Work Allocation): Systematically allocation of complete audit works to the audit staff(Employees, Articles etc..). 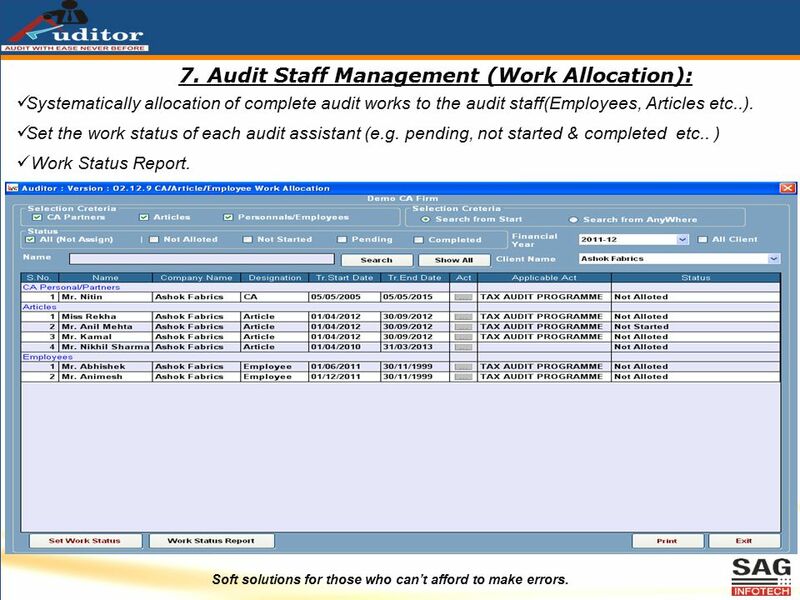 Set the work status of each audit assistant (e.g. pending, not started & completed etc.. ) Work Status Report. 12 Soft solutions for those who can’t afford to make errors. 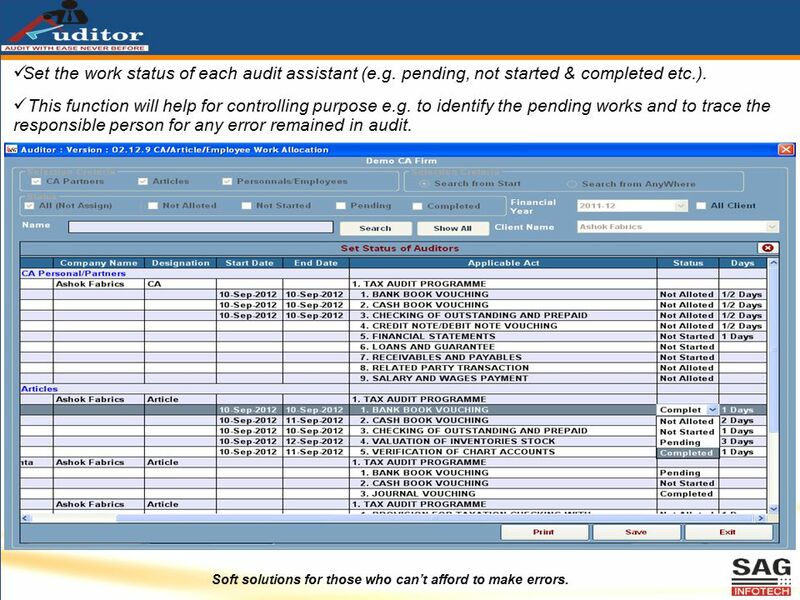 Set the work status of each audit assistant (e.g. pending, not started & completed etc.). This function will help for controlling purpose e.g. to identify the pending works and to trace the responsible person for any error remained in audit. 13 Soft solutions for those who can’t afford to make errors. 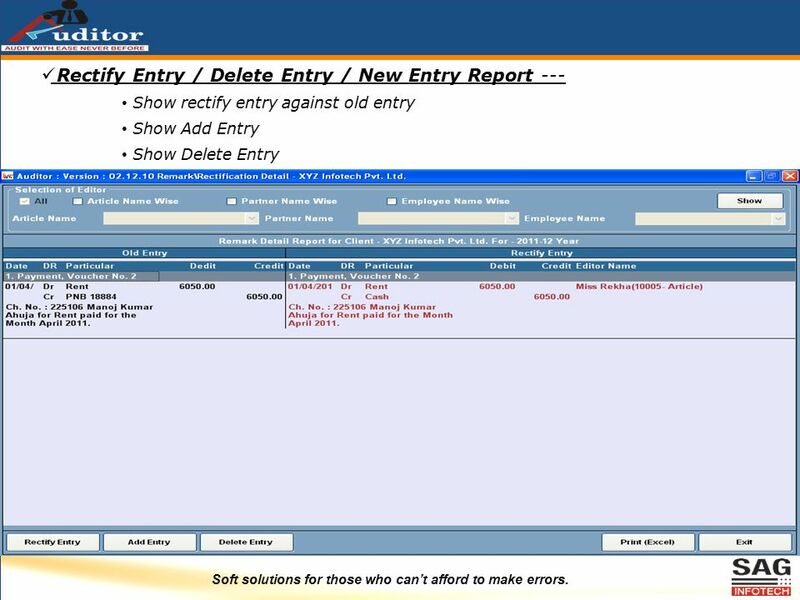 Work Status Report In this report, audit service wise details are available. e.g. bank statement is checked by Mr. A and Mr. B. 15 Soft solutions for those who can’t afford to make errors. 9. Various Books and Registers are available. 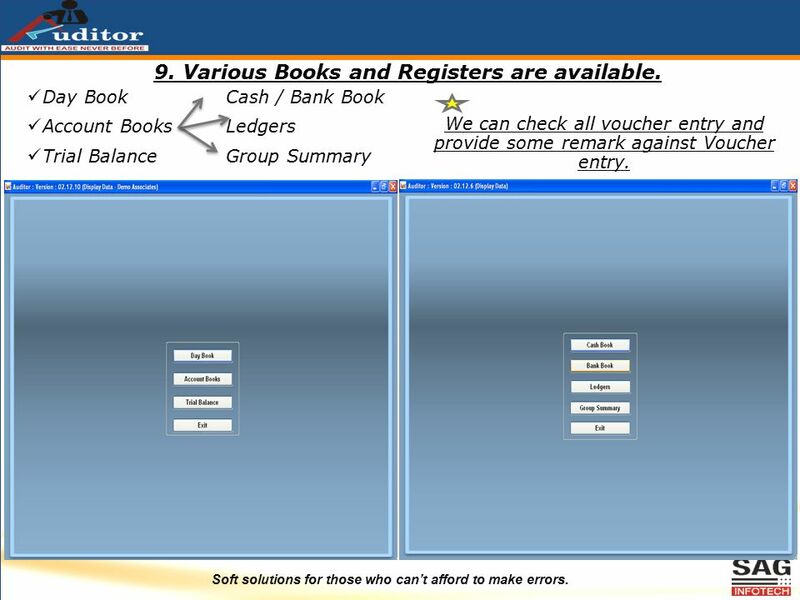 Day Book Account Books Trial Balance Cash / Bank Book Ledgers Group Summary We can check all voucher entry and provide some remark against Voucher entry. 16 Soft solutions for those who can’t afford to make errors. 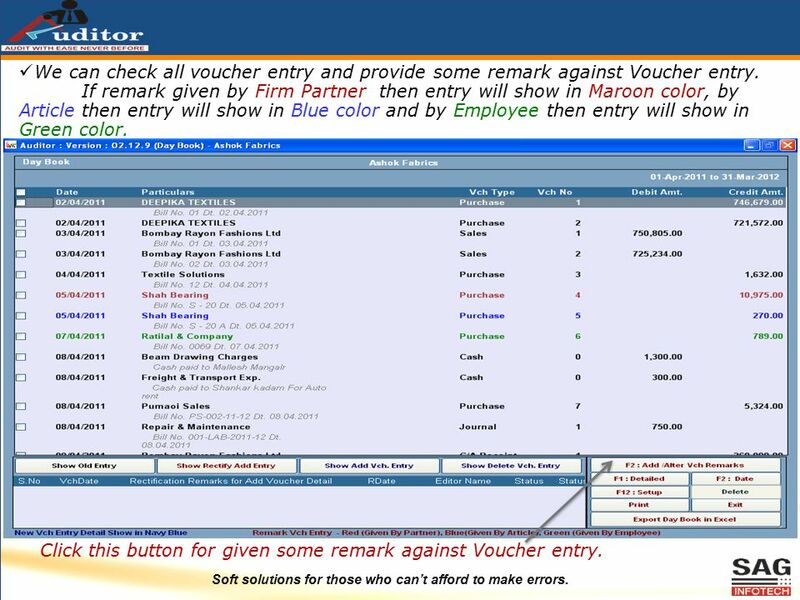 We can check all voucher entry and provide some remark against Voucher entry. If remark given by Firm Partner then entry will show in Maroon color, by Article then entry will show in Blue color and by Employee then entry will show in Green color. Click this button for given some remark against Voucher entry. 17 Soft solutions for those who can’t afford to make errors. 10. Tax Audit : Checking sections which are needed in Tax Audit for fill Form 3CD. Section 40A(2)(b) for relation person payment report. Section 40 A(3) for exceed cash payment report. 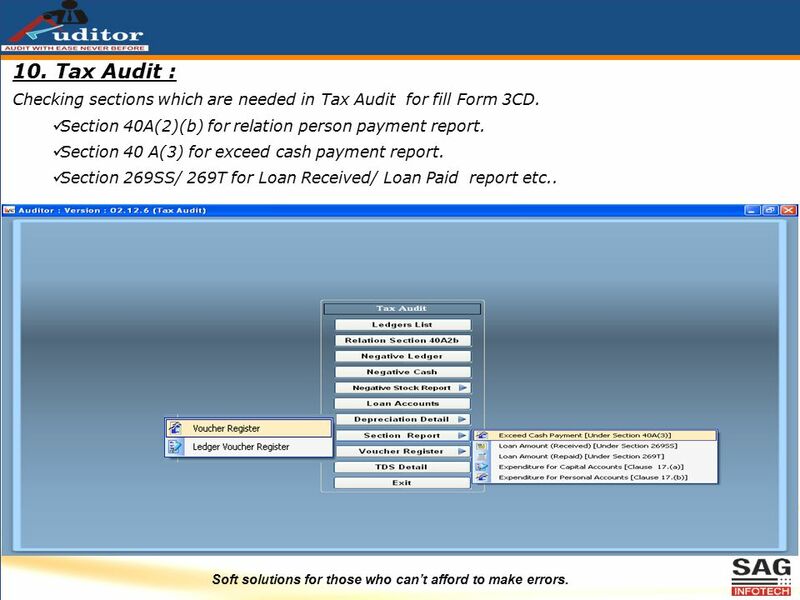 Section 269SS/ 269T for Loan Received/ Loan Paid report etc..
18 Soft solutions for those who can’t afford to make errors. 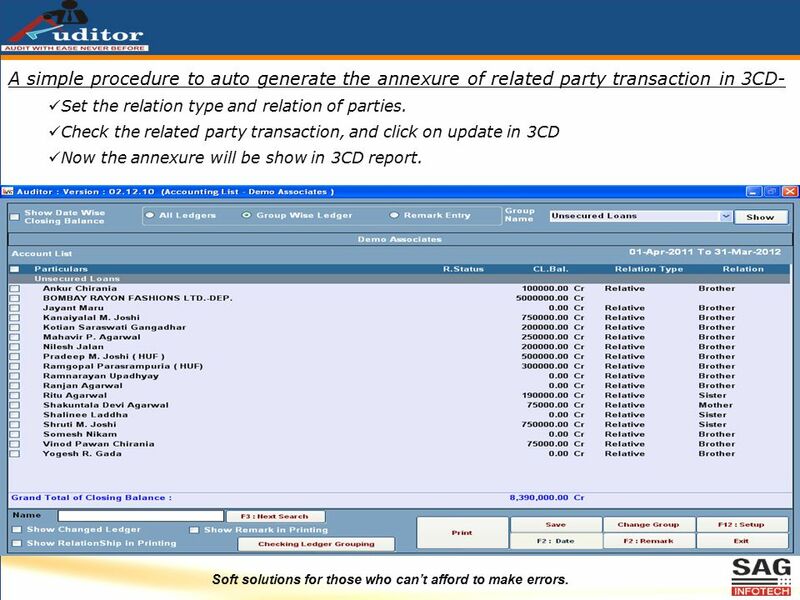 A simple procedure to auto generate the annexure of related party transaction in 3CD- Set the relation type and relation of parties. 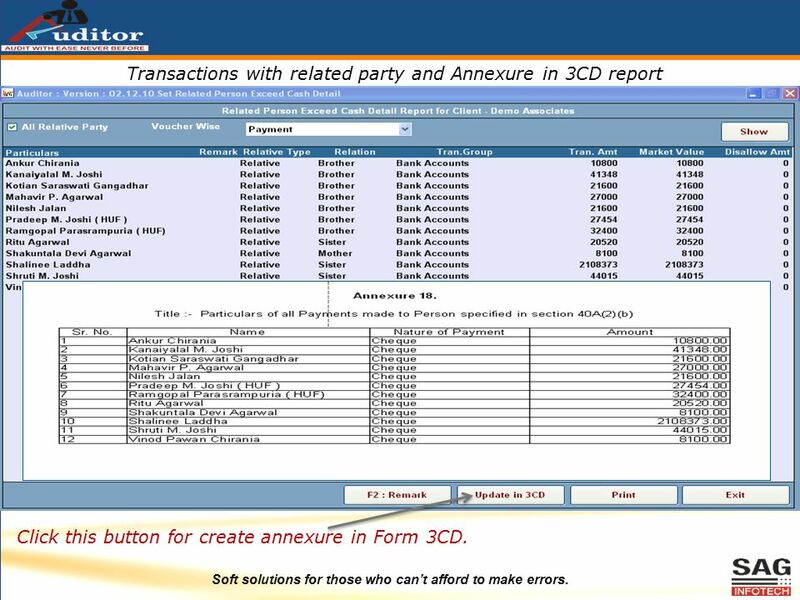 Check the related party transaction, and click on update in 3CD Now the annexure will be show in 3CD report. 20 Soft solutions for those who can’t afford to make errors. 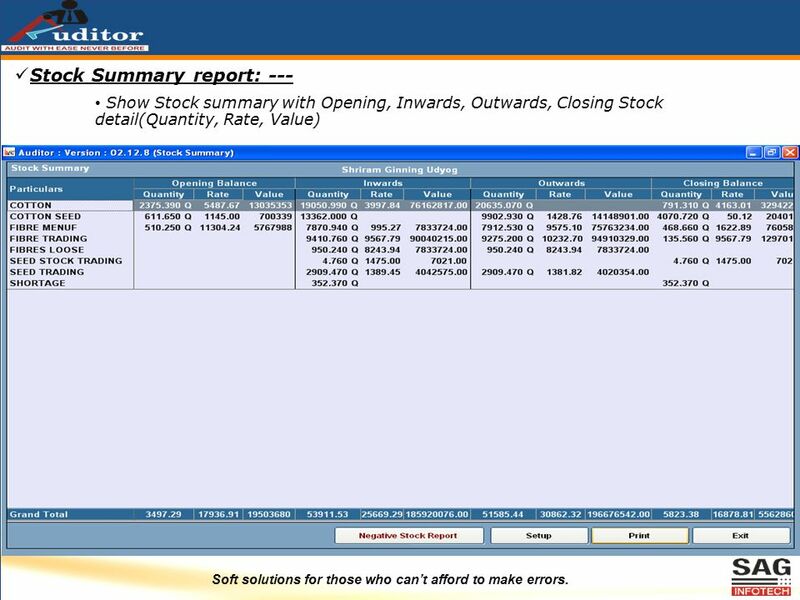 Negative Ledger Report --- Show ledger detail when the closing balance is negative (e.g. If ledgers is of Debit nature but closing balance is Credit, these type of ledgers are shown in negative ledger Report. 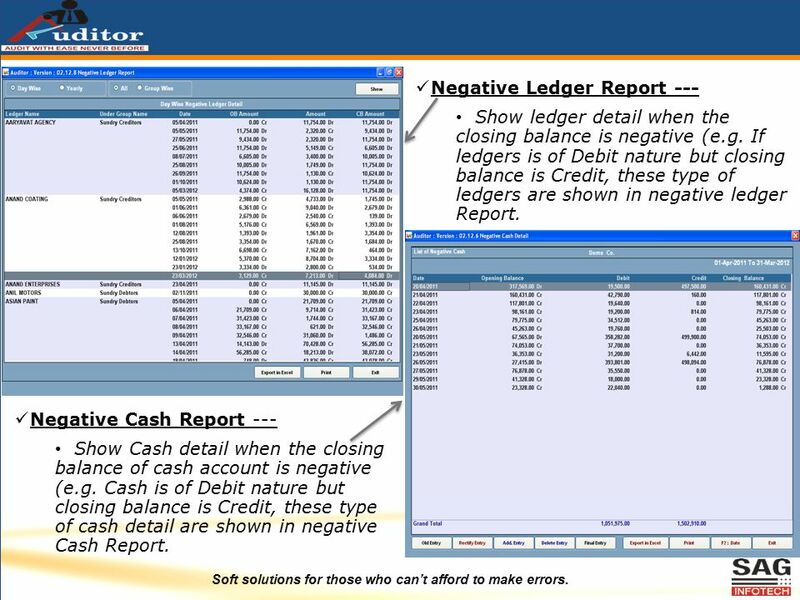 Negative Cash Report --- Show Cash detail when the closing balance of cash account is negative (e.g. Cash is of Debit nature but closing balance is Credit, these type of cash detail are shown in negative Cash Report. 21 Soft solutions for those who can’t afford to make errors. Click this button for Create Amount Slot as per requirement. 11. 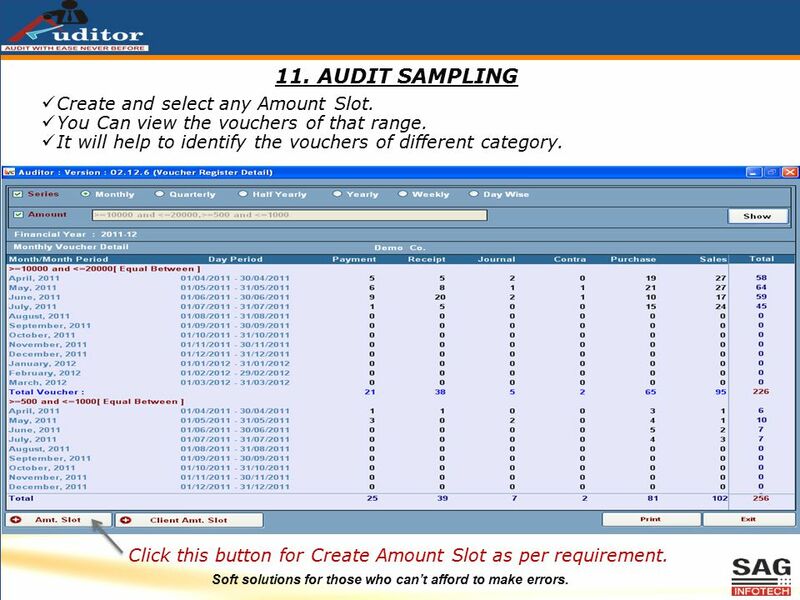 AUDIT SAMPLING Create and select any Amount Slot. You Can view the vouchers of that range. It will help to identify the vouchers of different category. 22 Soft solutions for those who can’t afford to make errors. 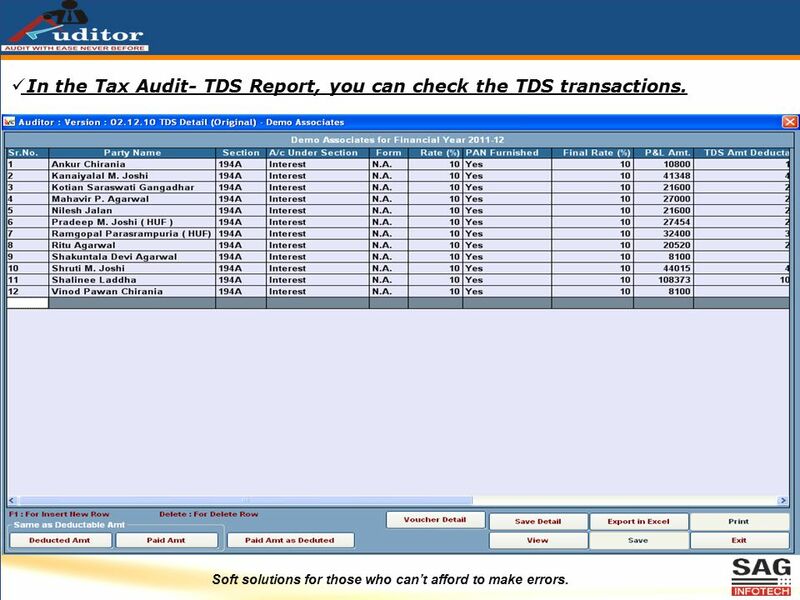 In the Tax Audit- TDS Report, you can check the TDS transactions. 23 Soft solutions for those who can’t afford to make errors. 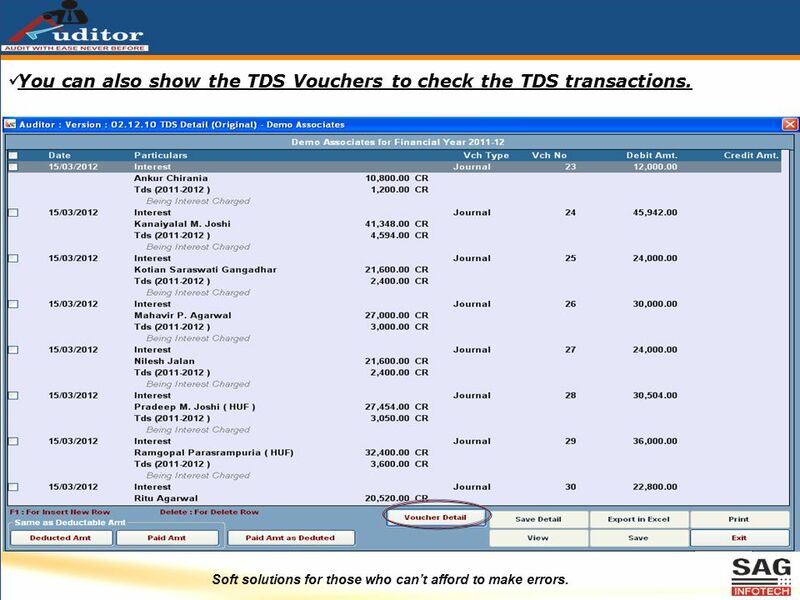 You can also show the TDS Vouchers to check the TDS transactions. 27 Soft solutions for those who can’t afford to make errors. 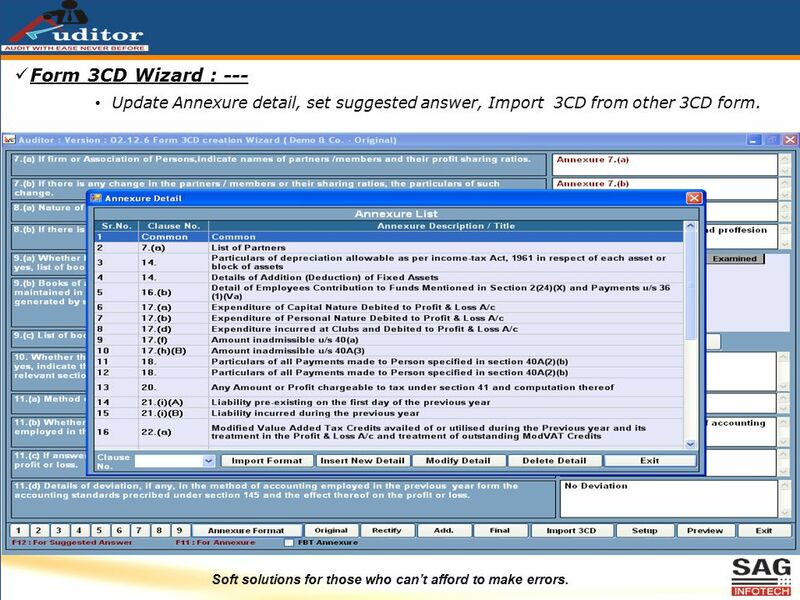 Form 3CD Wizard : --- Update Annexure detail, set suggested answer, Import 3CD from other 3CD form. 30 Soft solutions for those who can’t afford to make errors. 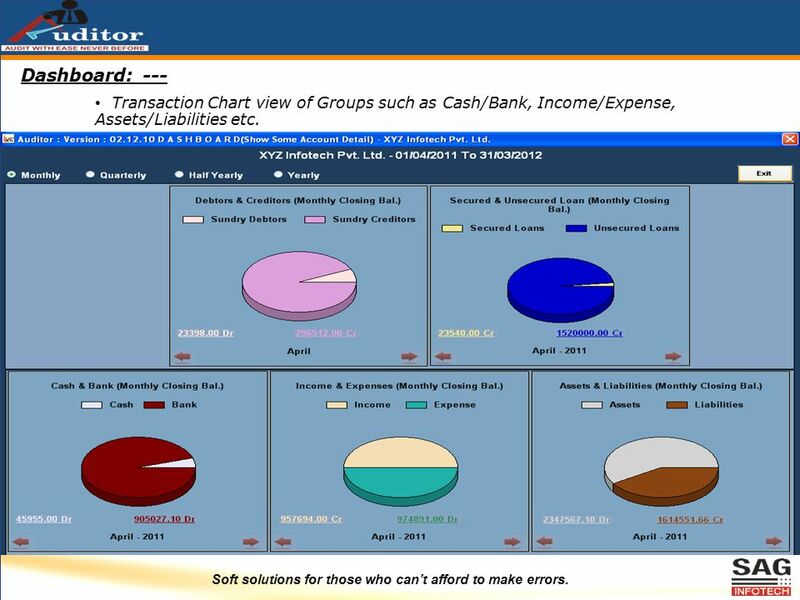 Dashboard: --- Transaction Chart view of Groups such as Cash/Bank, Income/Expense, Assets/Liabilities etc. 31 Difference between Genius and Auditor:- This is the general question arises that what is the main difference between Genius and Auditor? 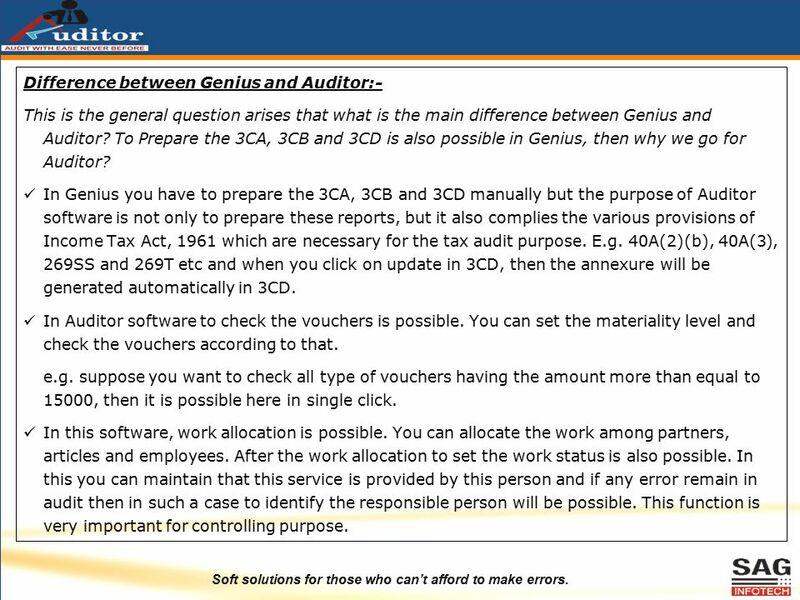 To Prepare the 3CA, 3CB and 3CD is also possible in Genius, then why we go for Auditor? In Genius you have to prepare the 3CA, 3CB and 3CD manually but the purpose of Auditor software is not only to prepare these reports, but it also complies the various provisions of Income Tax Act, 1961 which are necessary for the tax audit purpose. E.g. 40A(2)(b), 40A(3), 269SS and 269T etc and when you click on update in 3CD, then the annexure will be generated automatically in 3CD. In Auditor software to check the vouchers is possible. You can set the materiality level and check the vouchers according to that. e.g. suppose you want to check all type of vouchers having the amount more than equal to 15000, then it is possible here in single click. In this software, work allocation is possible. You can allocate the work among partners, articles and employees. After the work allocation to set the work status is also possible. In this you can maintain that this service is provided by this person and if any error remain in audit then in such a case to identify the responsible person will be possible. This function is very important for controlling purpose. Soft solutions for those who can’t afford to make errors. 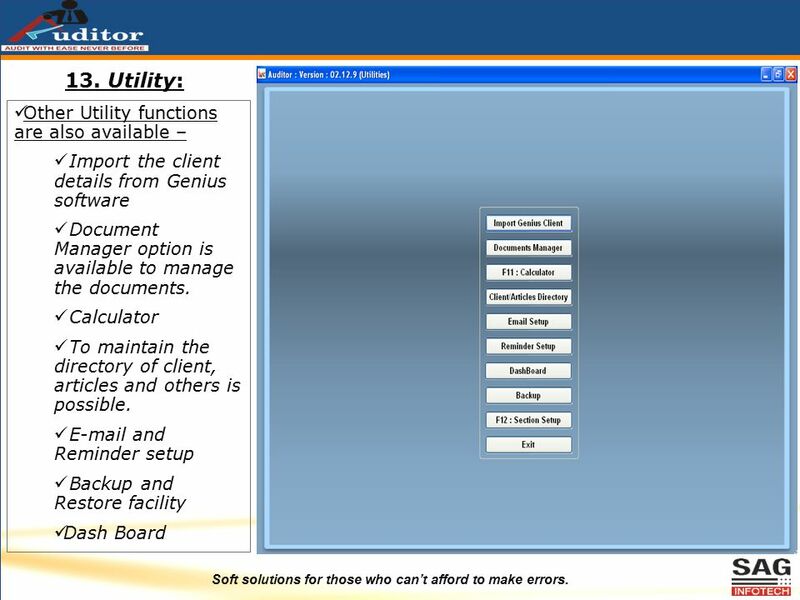 Download ppt "Soft solutions for those who can’t afford to make errors. Services Begin here...."
Soft Solutions for those who cant Afford to make Errors. Compexa IT Solutions New Delhi. Get Your Rice Mill Computerized. TransportPortal TransportPortal is a software designed for Transporters in Tanzania and East Africa. It helps to manage all basic things of a transport. E-Count LAB Lab Management with integrated Accounting. Test Report generation, Billing. Income & expense entry, Customer creation, Bank transactions. EASY AUDIT HELP. Click here to collect previous year data This is common master. Details entered here can be used in all assessee. Here you can prepare. Controlled Online Accounting General Ledger and Adjustments. 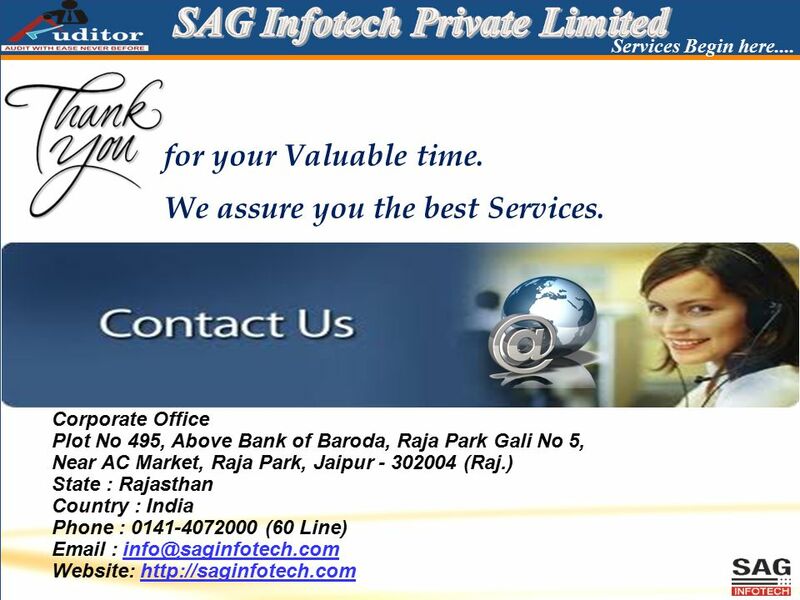 SAG InfoTech Private Limited Soft solutions for those who can’t afford to make errors. B ASIC F EATURES TO USE C OMPANY L AW S OFTWARE HELP MANUAL. S.NO.COMPARISON BETWEEN SAFEKHATAOFFLINE ACCOUNTING SOFTWARE 1 Completely hosted accounting information in the cloud Susceptible to computer/server. Simple & easy to use inventory management with fully tested accounting software integrated with our all products. All reports and data outputs required. 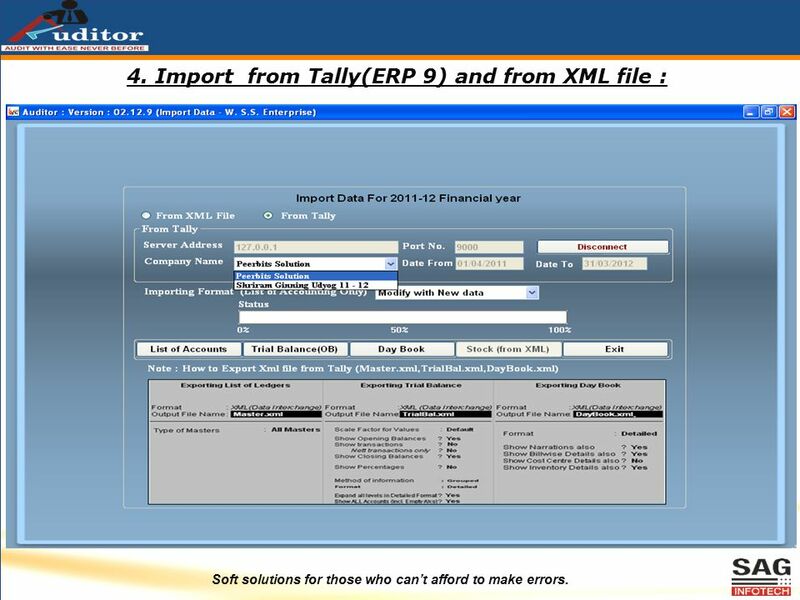 Audit Features on Tally9.ERP Together we Can. Work of Audit at Chartered Accountants Office  Audit Planning  Co-ordination with the Client for Start. 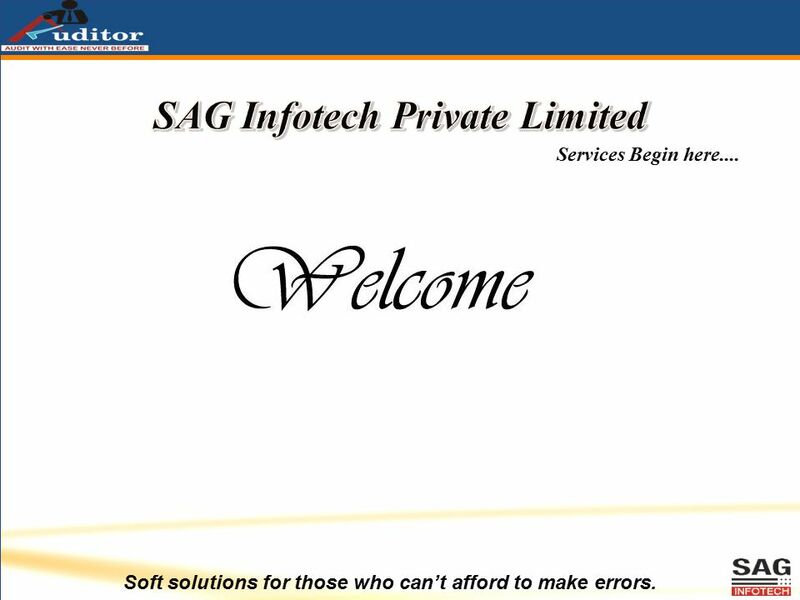 SAG InfoTech Private Limited Soft solutions for those who can’t afford to make errors. IMPORT FACILITY IN TAX AUDIT FROM TDS HELP MANUAL. SAG ONLINE PAYROLL Service begins here…. What is Gen Payroll? Gen - Payroll is a comprehensive and powerful HR tool for calculations of various components. 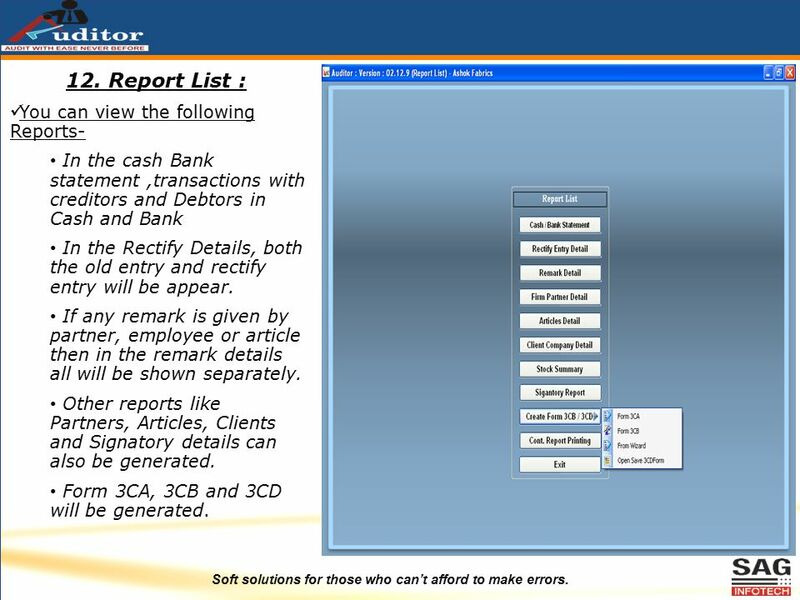 Gen - XBRL A Complete MCA e-filling Tool.. 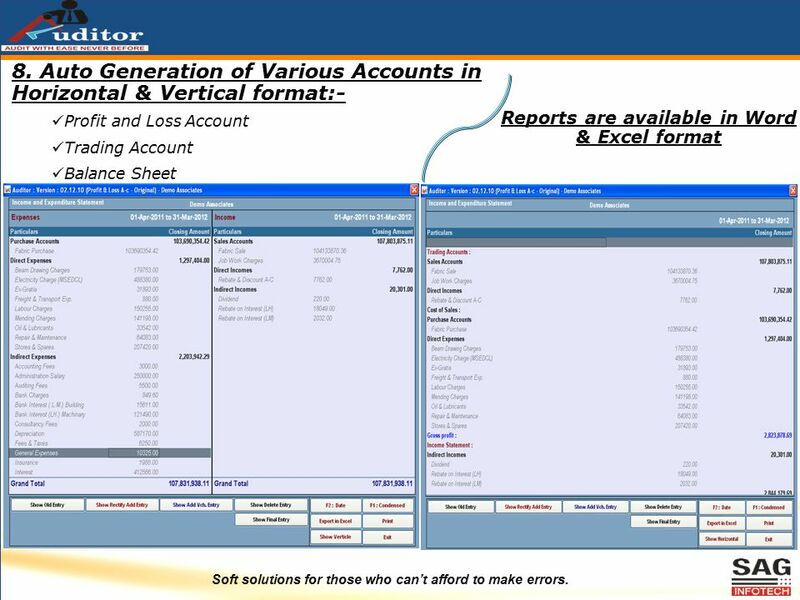 Features for Gen XBRL Template: Easy Navigation through Tree view of Taxonomy. No Expertise required, easy.